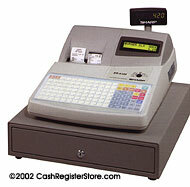 Sharp ER-A420 Electronic Cash Registers at Cash Register Store. Enhance your hospitality business with the advanced features and functionality of the user friendly ER-A420 electronic cash register. With advanced flash ROM technology and more standard features than you'd expect to find in its class, the compact ER-A420 delivers reliability, value and flexibility. With the ER-A420's spill-proof, micro-motion flat keyboard design, super fast alphanumeric receipt/journal printer with logo capability and high performance built-in software, you'll increase customer satisfaction while increasing operator efficiency. The ER-A 420's brilliant 2-line alphanumeric backlit LCD operator display will help reduce errors and speed ECR porgramming and the standard RS-232 ports allow for easy connectivity to optional peripherals such as remote printers or scales for even greater ECR capabilities. 2 station thermal, 13.3 lines per sec.